The most dangerous garage door problems can become completely harmless if you take care of them right away. It's not odd if you think about it, but there is a prerequisite since they must be visible or observable; on the contrary, you must fear problems that are not seen or noticed easily. The enemy is always more dangerous when it is invisible no matter how small it may be. When the door makes weird sounds and it doesn't come up or go down evenly, you will fix garage door torsion spring problems and the system will work properly again, but who can control the material of the panel, which may be eroded by elements right under our nose? First of all, when you are buying a new door, you must give attention to the quality of the material and colors and its strength. You should also be very careful when you are choosing colors to repaint it. You must always start with the application of coatings, which make the material more resistant to elements, and use proper and high quality paintings. Moisture is the worst enemy of wooden garage doors because it can penetrate the natural material and distort it. When the color starts peeling off even in tiny spots, moisture will find a way in and soon you will find mold on the surface that spreads quietly under the visible surface. Small dents and worn parts must also be taken care of to keep humidity away. Hence, when you are cleaning your wooden doors, you should make sure they are perfectly dry and try to spot weak spots, where the paint is damaged, in order to repair them. You should also check the condition of humidity in the garage because leaking pipes and high humidity can also affect the condition of the door. 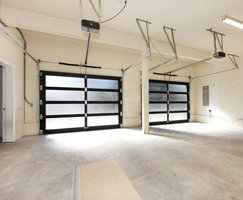 The new aluminum overhead doors are very resistant to elements and erosion, but the older ones can rust easily. Hence, you must clean them regularly trying to detect signs of decay. The inspection of the door and garage door maintenance must be regular, especially if you live in locations with high humidity, intense natural phenomena and extreme temperatures. Don't forget that too much sun can dry out wood as well creating open wounds, which may be the entry points of moisture.